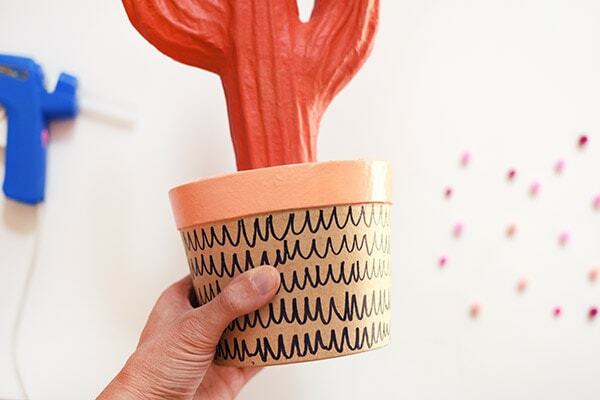 INSIDE : Add some fun color and whimsy to your home with a Potted Pom Pom Cactus! A modern take on any plant and best for the plant lover and black thumb! I love plants and I love pom poms so when I saw this gorgeous potted cactus at my local craft store… I KNEW it was meant to be. 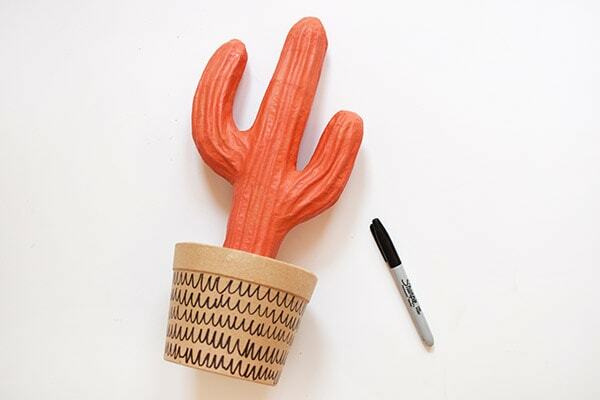 Come along with me as we take a plain simple paper mâché cactus and transform it to a fun colorful statement in your home, check out this DIY Pom Pom Cactus! This post may contain affiliate links. See my full disclosure. What supplies do I need to make a Potted Pom Pom Cactus? Are you in love with plants like I am? You might like some of my other Plant Crafts. 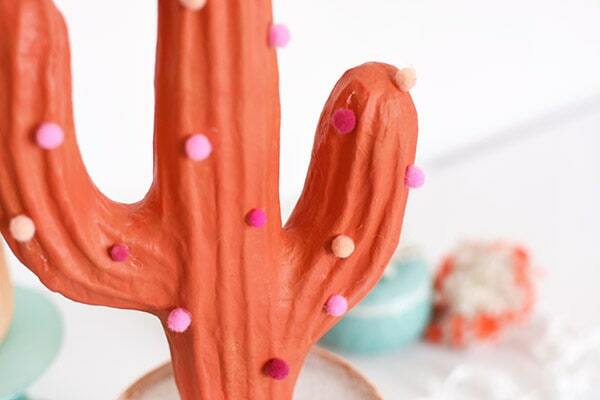 How to make a Potted Pom Pom Cactus? 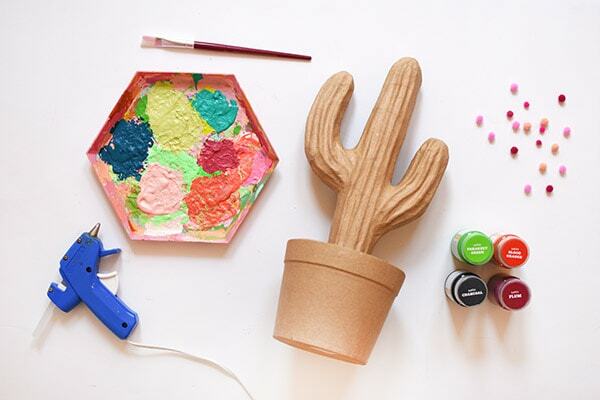 Start by embracing a fun bold color and paint your cactus. Mine took two coats of paint for even coverage. 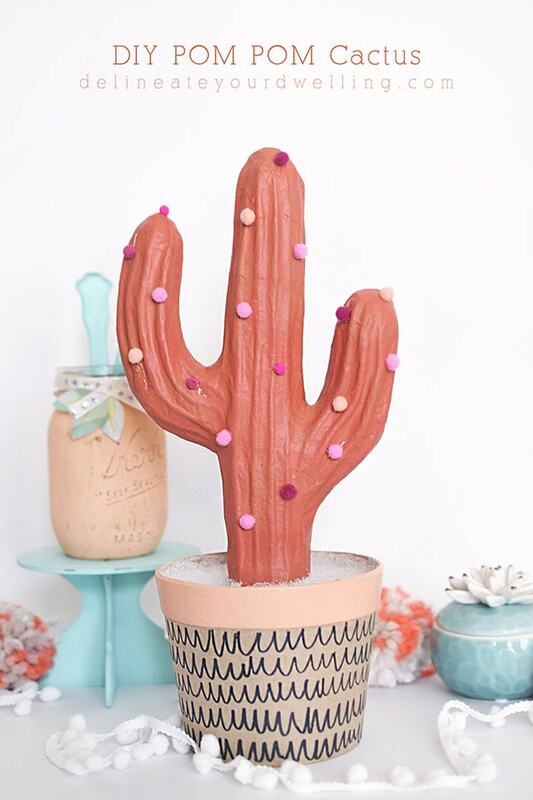 Once your cactus is dried, it’s time to add a little embellishment to your cactus pot! I used a black permanent marker and added fun doodles all around it. Here comes the fun part! 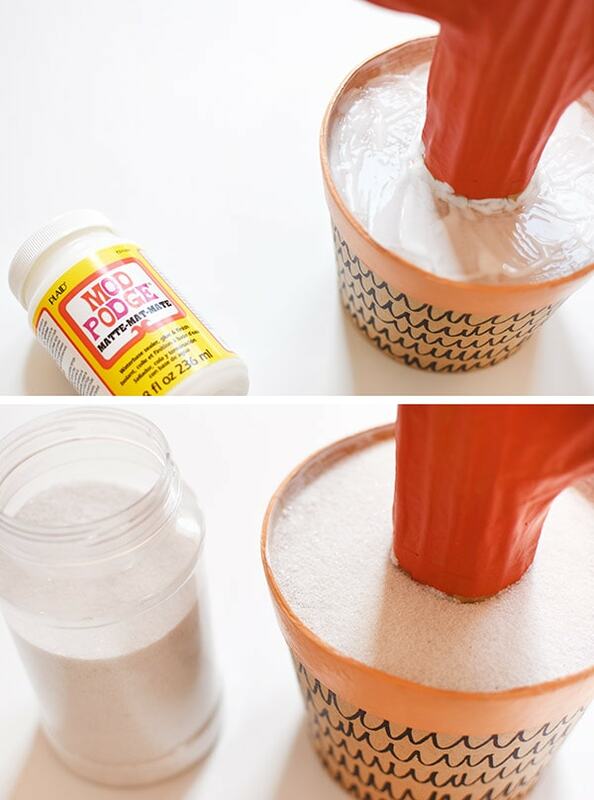 Use a clean paint brush and apply a HEAVY coat of Mod Podge all along the interior bottom of your pot. Next, pour a generous amount of white sand on top of that mod podge. Allow plenty of time for your sand to dry. It should be hard to the touch. I went ahead and did three layers of mod podge/sand. You can stop at just one layer, but you get a much thicker and consistent look with a few more layers. Next, I painted a light peach rim on my cactus pot. 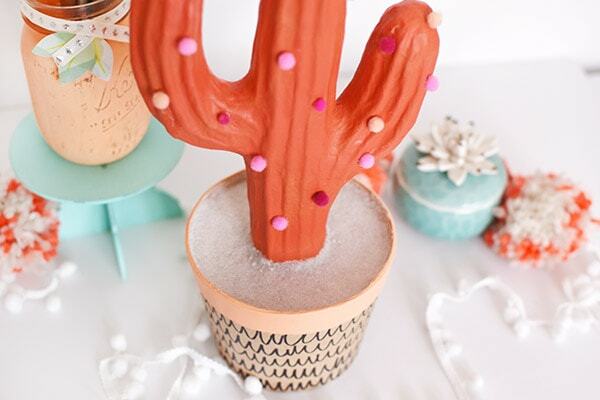 Lastly, sort out mini pom poms in the colors that match your painted cactus. I went with pinks, raspberry colors and peach pom poms. 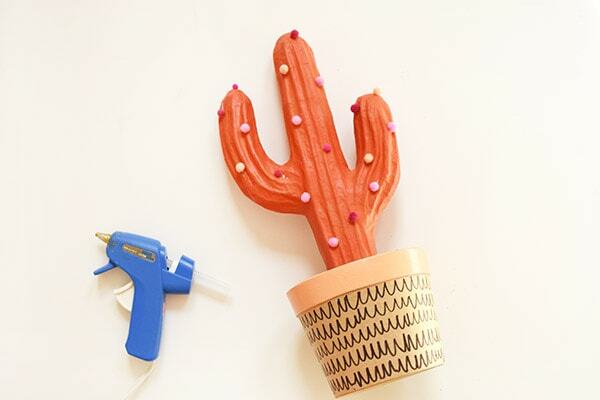 Using a hot glue gun, adhere your mini pom poms to your cactus to mimic the cactus spikes. 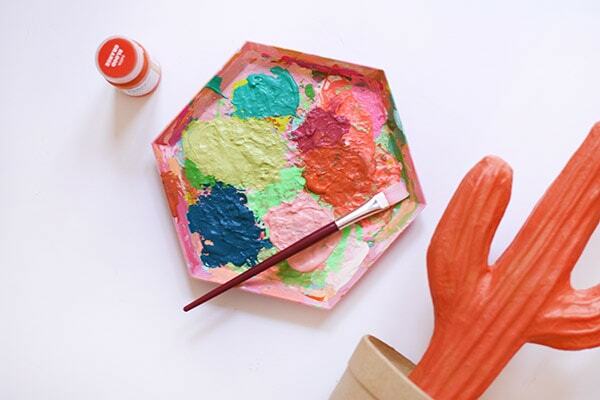 I just love the whimsy and color this fun craft project brings to my space! And I can never have too many plants in my house, but this one is even better because I don’t have to water him! HA. And don’t forget to pin this fun project for later!